Blockchain cryptography is at the very heart of what keeps cryptocurrencies and other virtual assets safe from hackers and other cyber-attacks. Public key encryption provides each user with a public and private key, which are extremely difficult to guess through brute-force attacks, at least using today’s computing resources. However, developments in quantum computing will make brute-force attacks far easier in the future. The mathematical principle behind prime number factorization is that any number, no matter how big, can be produced by multiplying prime numbers. It’s relatively easy to produce any number using prime numbers. However, it’s vastly more difficult to reverse the process and work out which prime numbers were multiplied to produce a particular value once the numbers become large. This reversal is called prime number factorization. Factoring prime numbers is easy with smaller values, but almost impossible with large numbers. Blockchain cryptography relies on prime number factorization for linking the public and private key. The prime number factors of the public key are what form the private key. Because today’s computers, even using the advantages of networks, cannot factor the private key, our virtuall assets can remain secure against attackers. Quantum computers are capable of performing many more thousands of calculations per second than today’s computers, even when accounting for the network effect. Quantum machines are still in a relatively early stage of development. However, its thought that over the next decade, quantum computers will become sufficiently powerful to break existing blockchain cryptography. 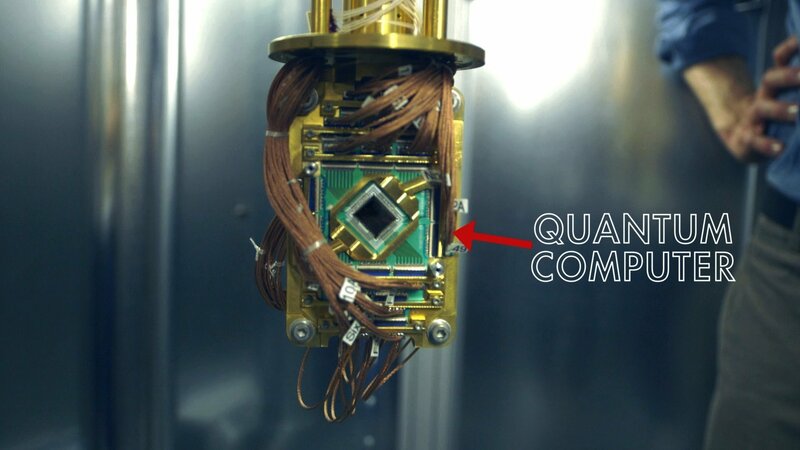 IBM is just one of the companies developing powerful quantum computers. Because all current cybersecurity relies on encryption using prime number factorization, the advent of quantum computing isn’t just a threat to blockchain encryption. It has implications across the whole of the web and all connected computers. However, centralized entities control pretty much all sites and networks outside of blockchain. Therefore, it isn’t a significant problem to implement an upgrade across the network or website. Satoshi Nakamoto is thought to own around a million BTC, not to mention his fortunes from the many Bitcoin hard forks over the years. If the Bitcoin network pushes through an upgrade to ensure quantum resistance, and Satoshi doesn’t upgrade his BTC wallets to the new protocol, his wallets become vulnerable to the quantum threat. So, even if all other holders of BTC upgrade their wallets, a quantum attack could still see Satoshi’s one million BTC stolen and then sold off onto the market in one fell swoop. Even worse, though, it’s not just whales that are at risk. After all, anyone consciously sitting on crypto-wealth will be eager to upgrade as soon as possible. However, it’s thought that around four million BTC are lost due to their users losing their private keys. Someone stealing and then selling this volume of crypto in a short time frame could have a devastating effect on the markets. Thus, developing quantum resistant blockchain cryptography is not necessarily the problem. The implementation across thousands or even millions of wallets becomes the real challenge. Most people still think the quantum threat is several years away, perhaps even more than a decade. However, the above scenario illustrates why it’s important that developments in blockchain cryptography already start to consider quantum resistance as a precautionary move. The QRL blockchain completely does away with the prime number factorization for blockchain cryptography. Instead, it makes use of Extended Merkle Signature Schemes (XMSS), which is a complex model. In principle, it involves generating key pairs using cryptographic hashing. This is the same concept as hashing a block in a blockchain in order to protect the contents. These key pairs are for one-time use only and are aggregated together using a Merkle tree. By using hash-based blockchain cryptography rather than prime number factorization the signatures become far more complicated to brute-force. This hashing makes them more resistant to quantum attacks. The public key hash then generates a one-time private key as an authorization signature for the transaction. After this, the wallet automatically creates a new public/private key pair for the next transaction, along with a sending or receiving address for the current one. In such a way, the transaction keys are separate from the address, making it more secure against quantum attacks.